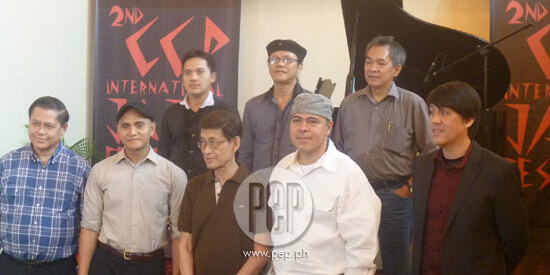 Cultural Center of the Philippines President Raul Sunico (leftmost) is photographed with performers of the 2nd CCP International Jazz Festival that will take place from September 17-22, 2013. For the second time around, the Cultural Center of the Philippines (CCP) will gather more than 100 jazz artists and 15 bands from the Philippines and all over the world (U.S.A., Europe and Asia) as they perform jazz music, in all its styles (from the big band, swing, blues, fusion and experimental) from September 17-22, 2013. The first edition of the international jazz festival, billed The Story of Jazz: 1st CCP International Jazz Festival, was held last August 2011. The 2nd CCP International Jazz Festival will be held at two venues of the CCP. This year’s edition will also feature workshops and lectures on various jazz genres. In addition, partnerships with some hotels (Bayview Hotel, Diamond Hotel, Manila Hotel, Sofitel Philippine Plaza Manila and Traders Hotel) will enable some of the festival performers to provide a sampling of their expertise in these venues. In a recent lunchtime press conference held at the Millennium Hall of the Manila Hotel, members of the press (including PEP.ph) were treated to a sampler of what to expect as some of the Filipino festival participants performed a number of jazz pieces. Humanfolk, with Mr. Johhny Alegre (guitar), Jay Ronquillo (bass) and Mr. Jun Viray (drums), performed the Herbie Hancock-composed jazz fusion standard “Cantaloupe Island.” This was followed up by a solo piano performance by Mr. Emy Munji who performed “Laura,” adapted from the theme of the 1944 movie with the same name. Finally, The Anything Goes Jazz Group, with Mr. Michael Puyat (vocals), Mr. Bobbet Bernadas (bass) and Mr. Archie Lacorte (saxophone), rendered their version of “The Lady is a Tramp,” a Richard Rodgers swing anthem from the 1937 Broadway musical Babes in Arms. He pointed out that “the global attraction of jazz has reached a wide spectrum of enthusiasts, including Asia where its own brand of Eastern and ethnic music seems to fuse well with its style." The CCP President has high hopes for the 2nd CCP International Jazz Festival. "Through the festival, CCP hopes to bring the Philippines into the mainstream of global jazz activity and make it a legitimate and recognized venue for international jazz festivals," he stated. Another objective the CCP hopes to achieve, according to Mr. Sunico, is that, thorough this jazz festival, it would “create a harmonious relationship among the country's jazz figures and groups. With the establishment of so many of these ensembles, it is imperative for the CCP to provide a prestigious venue for our talents to perform and be discovered, to play and to listen, to seek a camaraderie with which to collaborate with other groups, and to help propagate this wonderful musical genre for everyone to enjoy." Performers and groups whose production and equipment set-up would call for a larger stage and expected audience size will perform at the CCP’s Tanghalang Nicanor Abelardo. The September 17 kick-off event will feature Blood Drum Spirit (U.S.A.), headliner of the 2011 CCP Jazz Festival; Malaysian acoustic guitar player Roger Wang; Indonesian guitarist Wayan Balawan and local performers Brown Fix, bossa nova artist Sitti and the Brass Munkeys. On September 20, Italian accordionist, pianist and guitarist Fabio Turchetti and prominent Japanese jazz vocalist Charito as well as local artists AMP Big Band and the previously mentioned Humanfolk will next take the stage. On September 21, it will be the turn of the Dutch quartet Buzz Bros Band and local artists Akasha, UP Jazz Ensemble and the 25-piece PYSB Jazz Big Band. Blood Drum Spirit and local artist Bob Aves and the UST Jazz Band will perform on September 22, the last day of the festival. The Silangan Hall, on the other hand, will cater to jazz aficionados who prefer a more intimate setting. On September 18, Argentinian/Spanish jazz guitarist Neris Gonzalez and Japanese jazz artist Sin Kikuta, together with local jazz performer Sandra Lim-Viray, Low-Cal Jazz Ensemble and the previously-mentioned Anything Goes Jazz Group open the festival at this hall. On September 19, it’s the turn of pianist and guitarist Fabio Turchetti to perform with Blood Drum Spirit, the Bandung Blues Project of Indonesia, and local performers Majam as well as Emi Munji and his orchestra. Blue Drum Spirit and local performer Blue Sub closes the festival at this hall on September 21. For more tickets and information, please call the CCP Box Office at Tel. No. 832-1125 local 1409 or Tel. No. 832-3704 (direct line). Interested parties may visit the CCP website at www.culturalcenter.gov.ph. All shows start at 7:30 PM except for the final September 22 show, which starts at 9:30 PM.